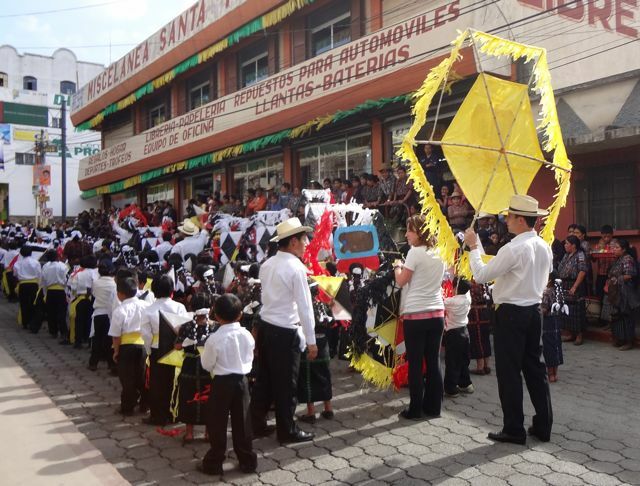 Last week we were asked to participate in a parade with one of our schools. You may know this already, but you should never say no to such a request. Walking towards the school we could hear the whistles of parade practice from the highway. When we arrived, we were greeted by a sea of rectangular cardboard cutouts, disinterested teenagers, and eardrum-rupturing marimba music. Celso, one of the third grade teachers, was running up and down the rows willing the children to do the wave as Bayron, the gym teacher, shouted instructions. We were given colored cutouts as well, and told to hold them high above our heads. Scene. Parade day is finally here! It's 6:45 AM and we're all matching--blacks bottoms and white shirts with a red sash separating the two. Instead of the 1x1 pieces of cardboard we practiced with, we are given massive octagonal kites, each easily 7 feet in diameter. 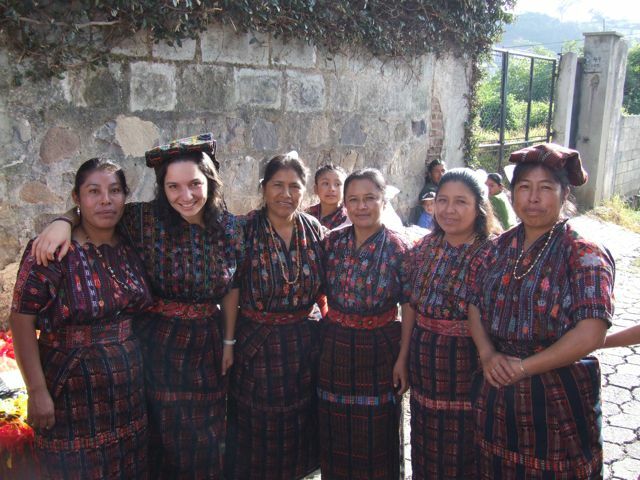 Six teachers surround me, outfitting me in traditional Mayan garb. I am to put on one of the kites like a backpack and Ginny is to "fly me" mid-parade. Cue music. Bow forward. Bow backwards. Bow left. Bow right. Hands up. Hands down. Spirit fingers. Move your hands in a circle, suavecito. And finally break into a hoppity traditional jig for ten minutes before repeating it all over again. Now multiply this whole extravaganza by five hours and you've experienced a day in our lives, where dancing almost always takes precedent. It's not the 9-5 you're used to, not even close, but participating in community events such as this is one of the most important parts of our job. Fostering relationships builds trust, even if you're bonding through the mutual knowledge that you look ridiculous and are not doing the Mayan jig correctly. But, in Guatemala trust is the foundation for everything. So, bring on the dances, the parades, and the bonding, as Ginny would say.